M. Aurelius Alexander Severus, the son of Gessius Marcianus and Julia Mamaea, and first coussin of Elagabalus, was born at Arce, in Phoenicia A.D. 205, in the temple of Alexander the Great. In 221, he was adopted by Elagabalus and created Caesar. 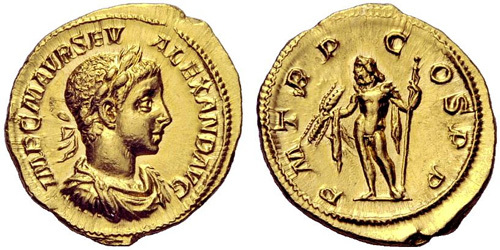 On the death of Elagabalus, on the 11th March, 222, Alexander ascended the throne. Obverse: IMP C M AVR SEV ALEXAND AVG, Laureate, draped and cuirassed bust right. Reverse: P M TR P COS P P, Jupiter standing left, cloak behind and over right arm, holding thunderbolt and scepter. Reverse: P M TR P COS P P, Mars standing left, holding olive-branch and spear reversed. Reverse: P M TR P COS P P, Salus seated left, feeding snake coiled round altar. 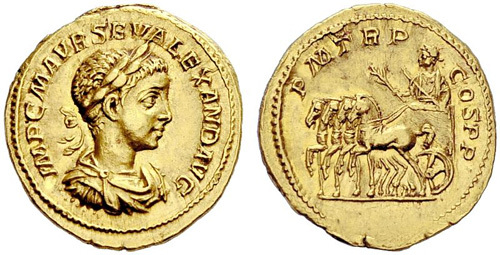 Reverse: P M TR P COS P P, The Emperor in slow quadriga left, holding sceptre and branch.